Having been tried, used and developed by several teams in recent history, 2017 finally looks to become the year in which (nearly) all teams add some form of S-duct on their cars. It is a solution which was first pioneered by Ferrari back in 2008. Back then, it was aimed at improving their airflow underneath the nose cone at a time when front wing development was possible in the central section of the wing as well. 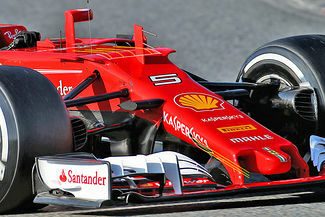 The major regulation changes of 2009 removed the possibility for Ferrari's nose ducting. A further restriction came after Mercedes used the front wing stalling double-DRS system. The FIA then stipulated that apertures more than 150mm ahead of the front wheel centreline could only be for driver cooling. Still, that enabled Sauber and Red Bull, and later also McLaren and Force India to use the commonly known S-ducts, featuring apertures underneath the nose cone and guiding air through an S-shaped duct through the nose to exit on the upper side, usually just ahead of the front bulkhead. In 2016, Mercedes and Toro Rosso implemented further improvements to the system. By carefully designing small inlets left and right of the underside of the nose cone, inlets were made possible within the scope of the regulations. This enabled much more straightforward internal ducting, and a more beneficial inlet location. The result is that this year, Toro Rosso modified its inlet design to resemble that of the Mercedes F1 W07 and Ferrari, McLaren and Williams following the same route. Red Bull Racing and Renault seem to have stuck with apertures less than 150mm ahead of the front wheel centreline. On the outlet side, teams seems to be following a route initiated by McLaren in 2015, where the air exited ahead of the transition from the steep upper nose profile to the flat upper side of the monocoque. Toro Rosso and Mercedes notably chose this route, and also split the outlet by putting the pitot tube in the middle. 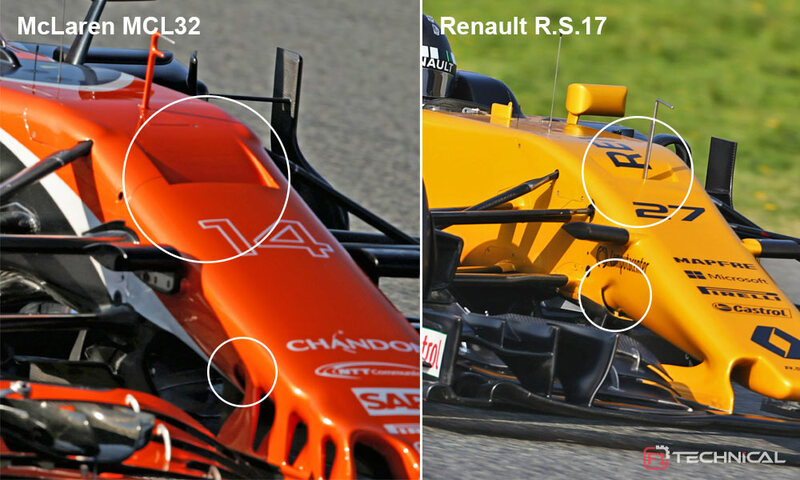 McLaren interestingly chose to the move the pitot tube out of the way this year and ended up with a similar solution to Renault.